It’s raining. Again. Sluicing over the city’s surfaces. Across roof tiles, down gutters and downspouts. Across stone and pavement. As surface water, the rainfall settles and puddles up in accidental and awkward places. But at the grassy edge of a low dip in the land, it begins to slow. Captured by tangled green shoots, water seeps into root systems beneath. This new layer of green urban infrastructure begins its work. The rain hovers in people’s conversations, seeps into collective moods. In cities across the world, there is renewed interest in the movement and storage of urban water – tactics for managing its volume, direction, and flow. How does this re-placing of water shape the ongoing life of the city? How are urban inhabitants to make sense of these new landscapes and phenomenal urban ecologies? This research project investigates the intersection of environmental and housing politics in Glasgow (UK) – a city where intensified processes of deindustrialization and redevelopment shape housing landscapes, public health outcomes, and persistent impoverishment. Urban Scotland provides a compelling case with a long history of progressive housing provisioning, activism around tenants’ rights, land reforms, and resistance to gentrification. Glasgow also shares with cities around the world the pressing challenges of surface and coastal flooding. 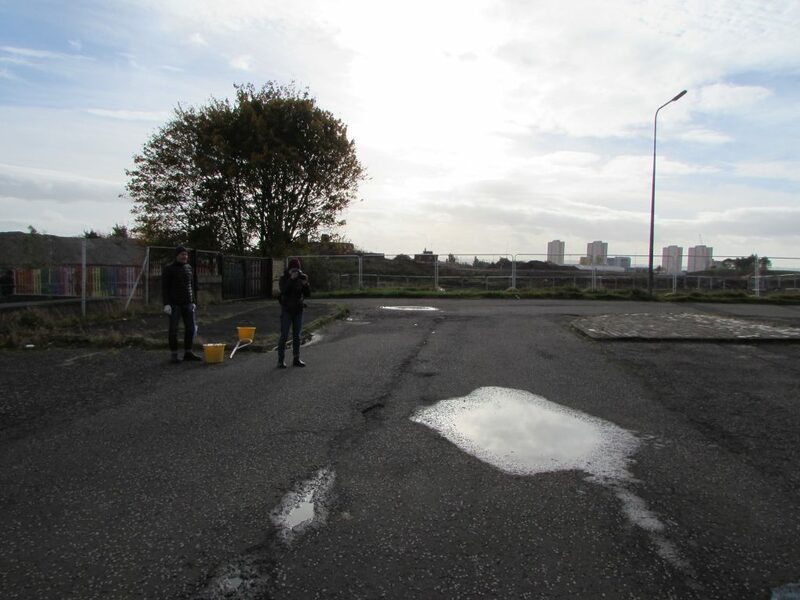 Initial collaborative research with artist-researchers Minty Donald and Nick Millar (Glasgow) examines relationships between housing, sustainable neighborhood drainage systems, and postindustrial urban redevelopment. This Glasgow-based research serves as a springboard for developing further comparative research on water management practices the global North and South.